It's the end of an era, and I'm both a little heartbroken to see the boys go and happy they went out like this. I'm sure we'll get snippets from the and of course more from the southern charmer because there are just so many characters she's gotta follow up on and so many different avenues for us to go down. I loved this book and at the end Adele's To Make You Feel My Love seemed to sum it up perfectly. I absolutely loved the ending of this series, I can't wait to see the newest guys and gals in the Saints of Denver series. We got a good new view of the few characters coming up next and I can't wait to dive in to these stories. But back to the Marked Men, oh my gawd Asa has been southern charmer for a minute, and we've peaked into who he was since book 2 so now that we're here years later is just both amazing and terrifying. How was Asa we got to know going to be a lead?? Well I should've remembered Jay loves her men complicated and a little dirty and Asa doesn't disappoint, he's brash, ballsy, tormented and hellbent on fighting back from the darkness. 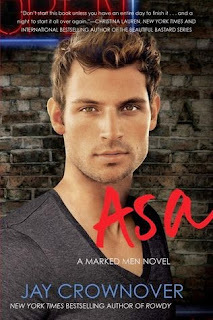 Asa at his core is a man with an addiction, to fast cars, fast cash, faster women and isn't exactly particular about how he goes about getting it at times, but after the events of Jet, and being given a second chance by Rome, Asa is doing his best to stay clear, and working in a bar, doesn't make it easy. I loved seeing that it was a daily struggle, it didn't come easy, he didn't get over it for the love of a woman (well kinda but not really), he fought it, and because of it he was brutally honest about his needs, his failures, his wants and he shared those with Rome, and Royal when she cared to see beyond what he could do for her. As the story progressed we got some serious angst, and catching up with the different Marked Men and their lives as they progressed along side Asa, seeing them motivated Asa, and at times depressed him because he didn't believe that was out there for him. I loved that most of the angst in this book was an internal struggle to walk a new path, and how to walk that path with someone who is just beginning to understand how rough your path is. I liked Asa's acceptance of his errors that lead to Ayd having to do some seriously effed up things to keep him from losing one too many times. I liked seeing the dynamic between the siblings and how as times passed and wounds scabbed over, and somewhat healed that their was progress between them. OMG that moment close to the end??? When all seemed to be moving in a whole new direction?/My heart almost couldnt' take it. I liked that Jay showed an alternative that would have been a bit heartbreaking but at the same time, could have totally happened. That dilemma?? Yeah I feel bad that he's in that position and I loved that Asa was man enough to make some hard choices. This book was a bitter sweet read for me, because I knew the Marked Men were coming to a close and it meant saying goodbye to the men and women I have loved for years. Asa's an outsider tot he group but his perspective is one that aides the group when they need it. Knowing that we're getting new stories form this world, and knowing that there will be glimpses of my faves in those make me happy. Reading the conclusion was awesome, and it kinda made me tear up (I'm not going to lie, I may have shed a few thug tears). I'm so happy to see the progress, and I know I can always revisit by re-reading, but it's the end guys, and I'm kinda happy but kinda sad as well. I am looking forward to the Saints of Denver series and have already ordered BUILT, and I'm dying to see more from the Denver crew. I hope you enjoyed reading along with me, let me know what you think about the books down below, Happy Reading my loves.